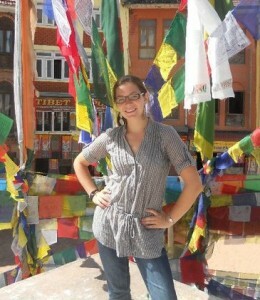 Anna Lashley was awarded The Emily C. Specchio Memorial Scholarship in 2009, studied abroad in Lugano, Switzerland, and graduated from Virginia Tech in 2010. She is currently spending five months volunteering at the Mercy Centre in Bangkok, Thailand. The Mercy Centre is a serene haven providing orphanages, education, HIV/AIDS care, food, and shelter to the poorest communities in Bangkok. We caught up with Anna to inverview her about her experience. Q: How did you get involved with the Mercy Centre? A: I was very lucky to get involved with the Mercy Centre. I have family and friends who have been to Bangkok and had interaction with Mercy in the past. During my senior year at Virginia Tech I was searching for a place to volunteer, a place where I could work with children in need, and preferably somewhere international. The Mercy Centre was suggested to me and after researching the foundation I realized it was the perfect opportunity. Q: What are your volunteer responsibilities? A: Wow, I will make a conscious effort to not let my answer to this question take up multiple pages of writing, which I think it easily could. Basically, as a volunteer at the Mercy Centre, my volunteer responsibilities consist of anything and everything. This week for example, I worked at a couple different events that were put on both for and by the Mercy Centre. This involves me helping with planning and setting up prior to an event, organizing while at the event, answering any questions that people outside of Mercy may have, taking care of the children if they are also attending the event, and representing Mercy in a positive light. Usually these are a lot of fun, and have allowed me to meet amazing people from international organizations, from the UN, from other foundations, and with interests similar to mine. I have assisted the communication office in creating brochures and pamphlets for different departments within the organization, and doing much of the email correspondence with English speaking organizations. Of course the bulk of my work, and the most fun (! ), is spent with children who live at Mercy or attend school in one of our slum kindergartens. I live in one of the Mercy Centre’s orphanages for young boys, and one main role of mine is to spend time with these boys, give them love, educate them, and help the house-moms in providing a safe, happy home for them. I eat with them, watch TV with them, play with them, take them to various activities, and act somewhere between an older sister and a mother figure to them. Week day mornings I work in one of the kindergarten classrooms here at the Mercy Centre helping the teacher and attempting to teach basic English to the students (i.e. ABCs, 123s, days of the week, months of the year, colors, etc.). I spend the afternoon doing one-on-one teaching of all core subjects with one of our children who is being home-schooled, and then in the evenings I move right into more teaching when I tutor our five children who received scholarships to an international school in Bangkok. As you can see it’s a non-stop job, but I enjoy it every single day. Each week brings something new, and I am amazed at the opportunities and new experiences I have had from volunteering here. Q: How have you changed as a person from when you first started? A: Oh my gosh, I don’t even know if I am the same person anymore, it feels like everything has changed! For one thing, my independence has skyrocketed. I mean, showing up to a completely foreign country, to live as one of two white people in a slum community where nobody speaks English, that’s pretty tough. I had nobody to cling to for help, I was on my own. There was a lot of frustration, loneliness, confusion, communication issues, you name it, but I got through it, and I worked to be accepted into the community. Now I feel like if I can get through this on my own, I can do anything, it’s a great feeling. I am also a lot more appreciative. There are so many little things that I realize I am lucky to have grown up with that I never even thought about before. Hot water, clean clothes, a bed that doesn’t hurt to sleep in, meals that don’t include rice, living within an hour of my school, not having to share toys with 40 other children. The greatest part though, is that while I’ve come to appreciate these things more, I’ve also come to realize how unnecessary they are. I no longer think, worry, or complain about little things that used to be on my mind, I now understand how insignificant they are, and that the problems I thought I had really do not matter. There are so many more important things that people in the world have to worry about, life essentials such as where they’re going to sleep, what they’re going to eat, if they will receive an education or not. The issues I thought I had when I was back in the U.S. never compared to any of these. A third major change in me is that I am a lot more learned than I was when I first arrived. I have not taken any classes, or received any instruction, but I have been privileged to an enormous amount of invaluable information. I have learned, from witnessing first-hand, about living in the slums of Thailand, about street children, child trafficking, prostitutes, AIDs, but I have also learned wonderful information about Thai culture, traditions, family life, and the inner-workings of the community. All of this knowledge has absolutely had an affect on me, and has made me a new person. The other day one of the house-moms criticized me on not bending over while walking past adults who were sitting – as this is a known procedure done out of respect. As she was making the comment she explained that I am a Thai-woman now, and need to do as other Thais do. This is one of the greatest compliments I could have gotten. I have listened, observed, learned, and have taken everything in, and have been accepted into part of the Thai community. So I guess a shorter way of answering your question would have been: so many things have changed about me that I have adapted into a new, very happy and content person. Q: You hadn’t had the opportunity to travel much before studying abroad in Lugano. How much did traveling around Europe through the Lugano study abroad program at Virginia Tech play a part in your ambition to start your current position? A: Honestly, going abroad to Lugano, and having the opportunity to travel around Europe played an absolutely essential part to me getting to where I am now. I had never been out of the country before going to Lugano, and as soon as I began traveling I realized I was never going to be able to stop. America is a great country, but I think that so many people never really realize how big the world is, and how many things there are to see and learn outside of the it. I was given the chance to acknowledge that what I wanted more than anything was to travel the world and learn about the people, the cultures, and the major issues surrounding them. I don’t want to learn things from books in class, I want to see them, to feel them, to hear about them from the people who experienced them first hand. Going to Lugano taught me this, and helped me to figure out what I wanted to do with my life. I can truly say that I do not know if I would be sitting here, in my room in the orphanage in Bangkok, if I had never studied abroad. Q: What you are doing now reminds us much of something Emily might have pursued post-college. Did your scholarship, interaction with the foundation, and learning Emily’s story help inspire you to travel even more and make a difference? A: Absolutely! As I said before, going to Lugano was what made me realize how badly I wanted to travel more and learn more about the world, and that would not have been possible without being awarded the Emily C. Specchio Scholarship! However, I not only discovered my love of traveling through the scholarship, I also developed a new sense of purpose. After hearing about the beauty and kindness Emily possessed, I was honored to be chosen as a recipient of the scholarship. Emily did so much for others in her short life and I really did feel inspired and as though it was my duty to do great good for people around the world with her in mind. I believe that Emily’s family, and everyone at the foundation, select scholarship recipients based on people they think Emily would be proud to have do work in her name, and I hope that I am living up to being one of these people. Q: What are your career plans and goals after this international experience? A: It’s hard to imagine leaving my life here and returning back to America to face the real world as a college graduate. I could easily just stay here and continue doing what I am doing, but I suppose I cannot work as an unpaid volunteer forever. Following my time here in Bangkok I plan to attend law school and focus on international law and human rights. I hope that with the knowledge of the law I will be able to return to Thailand, or another country with similar human rights issues, and make a tangible difference in combating the problems head on. I believe that I primarily want to focus on children’s rights. There are children around the world who need protection, education, and people to fight for them, and I would like to aid in giving them these important things. From what I’ve seen over the past many months, children in these dire situations really do want to improve their lives. They really want to be educated and do not want to follow in the footsteps of their parents, or whomever was responsible for them being where they are now. All they need is a chance, an opportunity to get off the street, get an education, have a normal life. My career goal, as ambitious as it is, is to give as many children this chance as I can. Q; How can people learn more about the Mercy Centre and your experience abroad? A: To learn more about the Mercy Centre people can visit the foundation’s website at www.mercycentre.org . There is a lot of really great information on there about what the Mercy Centre does, pictures and stories about our children, and how people can sponsor children or donate money. 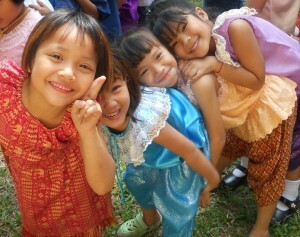 There are a lot of ways for people to help, and the children of Thailand need as much help as they can get. I encourage everyone to look into the information that the Mercy Centre has to offer, and to think about making a donation. I can attest to seeing first-hand that donations and sponsorships really do go straight to the children, and that the people at Mercy do everything they can to give these children a better life. We wish Anna the best of luck through the rest of her volunteering and future endeavors! We invite you all to leave comments & well wishes below! Wow! What a wonderful experience. I am so amazed at what one person can do. Anna- your story is truly inspiring. Your enthusiasm, compassion and sensibility makes your hope for improving the future of these children palpable. Thank you for sharing. Anna, What an amazing testimony! Your dedication and love working with these children makes me realize the compassion young adults like yourself have. Kudos to You!! Anna, your work amazes me,going to a strange country by yourself is the first amazing part but giving so much is the wonderful part Congratulations,I wish you happiness and success in your future. God Bless You. Kate, this was a great interview-you show many parts of Anna and the work that she is doing and how she has matured thriughout Lugano and Thailand. Kudos to you.